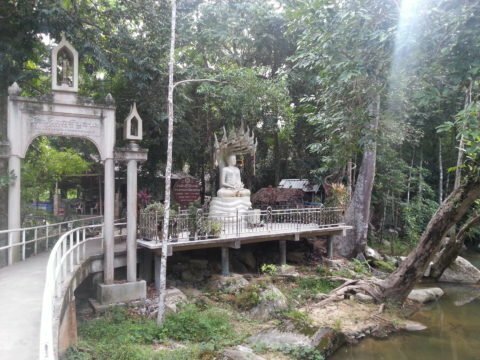 Wat Saunthamma Pala Nikrotharam, also known as Hat Lin Waterfall Temple, is small temple in a tranquil location at the start Hat Lin Waterfall near Na Thon on the island of Koh Samui. 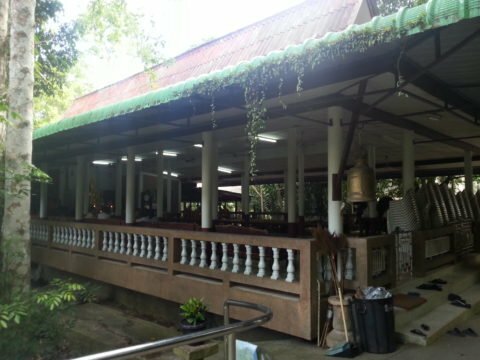 Wat Saunthamma Pala Nikrotharam is a popular place for local people to come at the weekends with families and relax. The main entrance to Wat Saunthamma Pala Nikrotharam is across a bridge over a pool at the end of the series of cascades making up Hat Lat Waterfall. There is a Buddha statute overlooking the pool and an entrance gate. From the bridge you walk along a concrete walkway past a large Ordination Hall which is white with a green roof. In Buddhist temples the Ordination Hall is a consecrated building which is designated as the place to carry out important rituals such as the ordination of new monks and reciting the 227 rules which Thai monks are required to follow. Beyond the Ordination Hall is the Shrine Hall which is more of an informal space where monks and lay people come together. This is where the monks receive alms in the morning from local people and provide religious instruction. 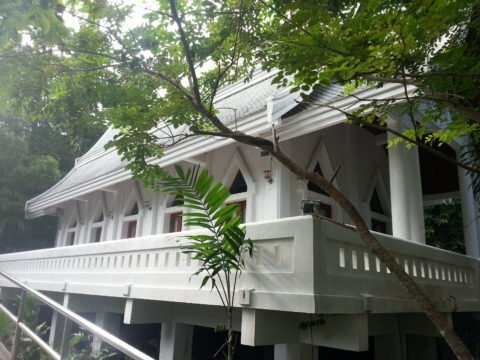 All part of the temple are surrounded by trees creating an atmosphere conducive to the contemplative study that is part of the Buddhist faith. Wat Saunthamma Pala Nikrotharam is near to the entrance to Wat Hin Lat waterfall. There are toilets and restaurants as well as vendors selling drinks, snacks, fruit, fish feed and dog food. Part of Buddhist belief is that a person can atone for wrong doing in this life and in past lives by acts of kindness to make merit (known as ‘punya’ in Thai). 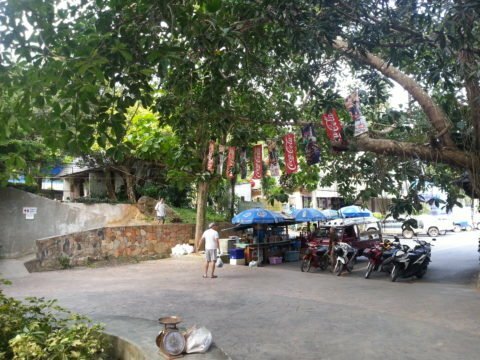 Buying food for stray dogs and feeding the many large carp which swim in the pool near the entrance to the park are believed by some as being a way of making merit. In Bangkok if you get up early enough you will see a more bizarre way of making merit in the form of buying goldfish to release into the dirty canals in the city centre. The area around the pool is shaded and peaceful and families like to come here to relax far from the busy coastal areas and towns of Koh Samui. 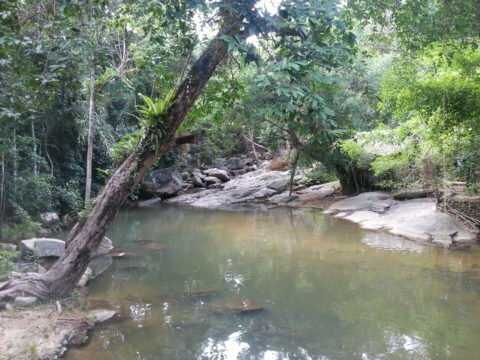 The waterfalls near the entrance are small and not particularly impressive outside of the rainy season. If you want to see more impressive waterfalls you need to trek up a steep slope for about 30 minutes before you come to the large main Hat Lin Waterfalls. 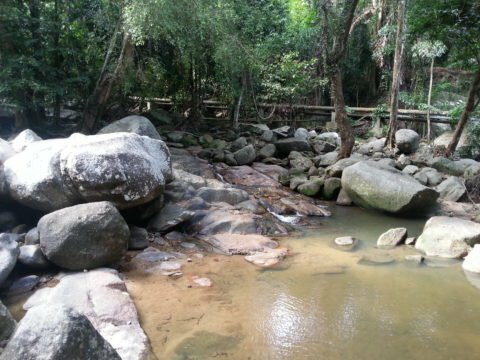 Hin Lat Waterfall Temple is located 3.8 km by road from Na Thon Pier.